Within the Pembrokeshire Coast National Park in South Wales, the Pembrokeshire Coast Path is one of the UK’s well established National Trails. Following the rugged Welsh coastline, this is one of the finest long distance walks in Britain. The path enjoys stunning views across sea and land as it twists along a coast line of ever-changing natural beauty. 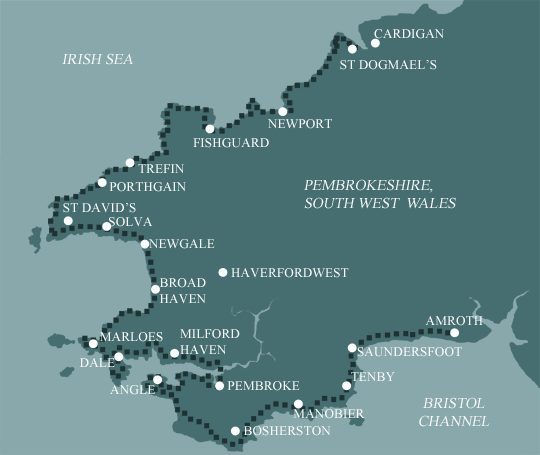 The Pembrokeshire Coastal Path is a varied and at times challenging walk. The undulating nature of some parts of the walk present physically demanding ascents and descents, however it can be enjoyed in shorter sections accessible to walkers of all ages and abilities. Bird watchers and plant lovers are drawn to the area due to the rich diversity of wildlife to be seen. Sea birds thrive on the inaccessible cliffs and offshore islands and, due to a multitude of habitats, an amazing array of flowers and plants can be seen at all times of year. As well as the whole route, we offer the south, central and north sections as self-guided walking holidays. All three are well worth undertaking in their own right, or take on each section separately until you’ve completed the whole path. Distances can also alter with high tides and the temporary closure of the MoD firing range, meaning walkers will cover between 168 (270km) and 186 miles (300km) in completing the route. Click on the links below to have a look at the details for each of the Pembrokeshire Coast walking holidays. We offer 4 holidays covering the whole route, from a challenging 13 day walk (only for the seriously fit), to a more leisurely 16 day trip. 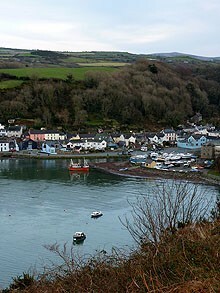 Most people spend a minimum of 14 days walking the whole Pembrokeshire Coast Path and incorporate rest days into this. In choosing your option, please bear in mind that you are walking day after day for 2 weeks, so don't be over ambitious with your schedule. The “tamer” end of the route but with a very varied scenery takes you up and down along spectacular precipitous cliffs, past MoD firing ranges and along the wild and remote Angle peninsular all the way past the industrial oil refineries and through the historic town of Pembroke with its beautiful castle. This section is a real mixture from its beginnings in a part of Wales devoted to industry which soon changes to gentle cliffs, wooded valleys and pretty bays. The terrain then changes again to high rugged cliffs leading on through the ghostly past of coal mining, interspersed with coves and sandy beaches. This is a great route in its own right from a wild, rugged coastline with old quarrymen’s houses, along beautiful snaking cliffs with coves, bays and beaches to the most strenuous section of the entire path taking in steep, overhanging cliffs and spectacular rock formations with the highest point of the coast path at 175 metres. Unspoilt countryside and with abundant wildlife. Explore the historic towns of Tenby and St Davids. We had experience on Coast to Coast and you did it again, very good. You also provided two weeks of sunshine in Wales in the package! Both my husband and I enjoyed our hiking holiday very much! We truly had a fabulous time. We found the service provided by Mickledore to be excellent in every way. Everyone we talked to or emailed with was friendly, knowledgeable and quick to respond to our requests. We found the trip to be well planned out and everything flowed smoothly. Our luggage transport was great – no problems. The booklet with each day laid out was excellent – the directions to each B&B were accurate and easy to follow. All necessary information that we needed for the hike, meal planning and transportation were provided. Every guest house or B&B we stayed at was excellent – they were clean, well kept, close to the trail and included excellent breakfasts.The hosts were friendly and helpful. We will definitely use Mickledore again and recommend you to our friends.